Clear your garden of dead leaves, broken flower pots and weeds. Let your garden become the perfect retreat in these stressful times. Make good use of water bodies and garden furniture. Like in any other area, feng shui gardening is based on the art of placement such that life energy or chi moves in a harmonious manner to bring about balance in the environment. A beautiful feng shui garden goes a long way in evoking emotions that make you feel good. Feng shui gardens have to be planned in a similar fashion as that of a feng shui house. The five basic elements of feng shui, bagwa or pa kua and the implication of the compass directions should be accounted for while designing a feng shui garden. Law of feng shui remains the same for all types of gardens, immaterial of their size. Feng shui encourages a lot of curves as these curves help in the easy flow of Chi thus bringing out the best of Chi or energy flow in the garden. Feng shui gardens represent a combination of vegetation, bushes and foliage along with bright flowers. The Chinese love red flowers as they believe that bright colors induce brightness and cheer in our lives. Understanding the aspects of feng shui and implementing them in the garden helps stimulate prosperity, luck and wealth. A typical feng shui garden consists of elements such as pond/waterway or fountains, red and orange flowers, trees and shrubs. Circular shapes in the garden are indicative of good feng shui, therefore try planting flowers with round shapes or place a circular pond in your garden. Keep all areas of your garden well lit. Make sufficient place for sitting in the garden using natural resources such as wood or bamboo. Statues made from stone, terracotta or any natural material can be placed to free any central spot or space in the garden. Flow of water along with wind is important principle in feng shui. Place a waterway along with wind chimes thus encouraging the free flow of chi or energy. Water also means wealth, success and purity as per feng shui. When adding a water feature to the garden, the feng shui corners of southeast (money and prosperity), north (career) and east (family and health) must be taken into account. Red and any other bright colored flowers are important in a garden adapting feng shui principles as these bright colors are known for their vivacity and vigor. Yellow is associated with healing, pink bears a connotation on your relationships and purple is representative of fortune and prosperity. Pleasant smelling and scented flowers such as roses and lavender and delicate plants that sway to a gentle breeze can be planted. Fish and birds are intrinsic to feng shui as fish is a sign of prosperity. Add a fish pond in your garden, preferably with goldfish in it. Position the lights for your garden in the southwest area as this helps improve marital and other relationships in your life. A perfect feng shui garden should have a combination of shrubs, flowers and trees that will linger through all the seasons. 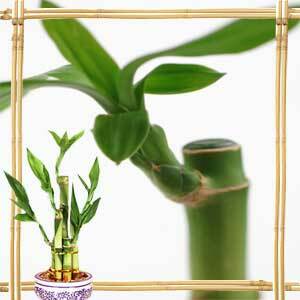 Maintain them well as these plant shapes will have an influence over the family members of the house. Southeast corner of the garden when planted with hale and hearty plants will promote prosperity, wealth and luck. You can grow herbs to add to your overall positive energy. Basil is considered to be a harbinger of wealth through personal ventures. Plant it in the northern part of the garden. Place jasmine to the southeast for monetary gains and southwest for improved inter-personal relations. Rosemary and Lavender have medicinal properties and when planted in your garden can go a long way in promoting better health and wellbeing. Avoid overbearing trees in the front of the house. Aim to have trees not higher than two-thirds the house height. Do not place too many cacti with spikes and thorns. Roses should not be placed in the entrance as the thorns in the plant mean harm and damage to the owners of the house. The front garden or yang must be open and unrestricted while yin - the back of the garden should be personal and private. The pathway from the garden to the house should not be encumbered and should be clean from hurdles. Compost piles must be concealed. Water in the garden should not stagnate and should be clean from debris as this will hinder the flow of positive energy. Don't plant trees in front of the main door as this affects the flow of energy. Trees that need regular trimming should not be planted as they might lead to a financial crisis. Yang the garden aspect and Yin the house aspect should be planned in a manner that they balance each other well. Flower beds along with curved pathways will help maintain equilibrium with the straight lines of the house. Overtly straight lines for pathways do not confirm to the principles of a feng shui garden. Juxtapose the roughness of rocks with the smooth surface of water as this brings about harmony between stillness and movement. A waterway can be replaced with a birdbath or a fountain where space is a constraint. Using curved stones instead of straight ones will reduce negative energy, sha. Replace straight tall hedges with flower beds or jagged shaped hedges; this will help maintain the balance of the garden as well as balance between the house and the garden. Choose plants with fat succulent leaves and avoid those with spikes. Soften edges with soft trailing plants taking care to see that they don't overgrow or block light. Herbs can add a powerful influence on your garden. In addition to their medicinal properties, they are said to promote good fortune. Be it basil and rosemary, lavender and jasmine, they can add color and influence your life. Add motion to the outdoor space with the use of wind chimes, flags and windmills. This helps increase the flow of chi. Use rounded off tables and curved chairs as they help in the flow of energy rather than blocking them. Round terracotta and earthen pot ware can be used to encourage the earth element in the garden. Wood is the best material among the rest when it comes to seating and other furniture preferences in your garden. Wind chimes, gongs and gazing balls help in the flow of positive energy and the gaze balls are supposed to wade off negative energy. Lights can be used to energize stagnant areas of your garden. 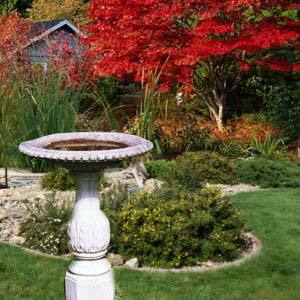 Choose ornaments that adhere to the proportion of your garden. First Published Date: 22 Feb 2007 Last modified Date: April 23 2019 This page may have been updated recently as new information is available or the content may have been edited for better readability.